Laptop Bag (Celine): Carry your laptop MICHE-style with this fashion laptop case. 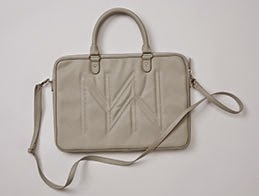 Lightly-textured dove-grey faux leather features oversized quilted MICHE monogram. Case interior and large slip pocket on the back are lined with canary-yellow fabric. Fits up to 13” laptops comfortably; comes with matching short rolled handles and long strap. Bag is completely self-contained—it is not interchangeable like our traditional bags. Silver hardware. Case dimensions: 15 ½” x 11” with a 1” gusset. Handles: 14 ¼” x ¾”, with a5 ¼” drop. Strap dimensions: Adjustable to 60” long x 5/8” wide, with a 26 ¼” drop.